1.) The public is the biggest landowner as far as forests are concerned: 10 percent of the Austrian nation and 70 percent of all lakes belong to the „Bundesforste", a company owned by the public. 2.) The wealthiest private owner of forests is the Styrian industrialist and offspring of a noble family Franz Mayr-Melnhof Saurau. 3.) More nobility: The former Princes of Esterházy, though princes no more, still own 22,500 hectares of forest in Austria, only - much of their possessions are in Hungary, though. Nicely supplemented with several castles in the Burgenland. 4.) Even more nobility: As of 2008, Prince Karl of Schwarzenberg is the Czech minister for foreign affairs - although raised in Vienna, where his family has had a palace for many centuries. 5.) The Benedictine monastery of Admont in Styria is a key-attraction due to its Baroque splendour - and owns almost 17,000 hectares of forest. 6.) And even more nobility here: The Prince of Liechtenstein, Hans-Adam II, owns a fair chunk of Austria, including 16,500 hectares of forest in Styria. 8.) Finally, a „real" company: The „Alwa AG" is a daughter firm of the BA-CA, one of Austria′s biggest banks - and owns 9,388 hectares of forest. 9.) Back to nobility again: The Salzburg relatives of the Styrian Mayr-Melnhof own - alongside with three castles - 9,000 hectares of forest in Salzburg and Upper Austria. 10.) Finally, back to monasteries: The Salvatorian monks of Gurk in Carinthia own and manage 8,508 hectares of forest, alongside with the cathedral of Gurk. In my article on the lakes of Austria, you find a pretty extensive and hopefully complete list of Austrian lakes. But who owns them? Lakes are real estate, and ignoring large ponds, almost all lakes of Austria belong to the Bundesforste, the federal institution of forestry. The same thing applies to most mountains, by the way. 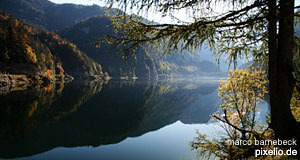 There are five proper lakes in Austria that are private property: The Austrian share of the Bodensee or Lake Constance belongs to the city of Bregenz; the Lake Achensee in Tyrol belongs to the city of Innsbruck; Lake Irrsee in Upper Austria belongs to a fishing society; Lake Mondsee in the Salzkammergut belongs to the "Baroness" of Waechter, formerly Imperial nobility; and Lake Neusiedlersee alongside with a fair chunk of the Seewinkel belongs to the former Princes of Esterhazy, so nobility again.